Choose Preferences from the iCal menu and click the Accounts icon. Click the Add (+) button at the bottom left of the window. The Add an Account dialog slides down. In the Account Type pop-up menu, choose CalDAV. Type a username (the short name), password, and the server address (myserver.domain.edu, for example). The Description field lists the user’s domain. You can change this to something more descriptive, such as Office Calendar. 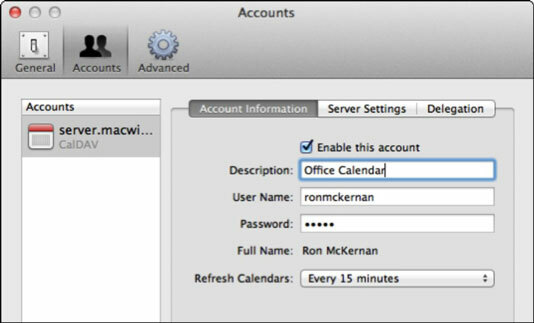 The Refresh Calendars pop-up menu sets how the client Mac updates calendar information (including invitations) with the server. The default is Push, which means that the server contacts the client. You can change this to a time interval or manually. You can also create another server-based calendar using an iCal client. When you create an account, you’ll see it when you close iCal Preferences. In Lion, the new account appears when you click the Calendars button in the upper left of iCal. In Snow Leopard, the left column of iCal has a Calendars heading. In either iCal client, there are two default calendars: Home and Work. These are local calendars. Below all this is a heading with the name of the Description field you typed in earlier. Below the Description field is a server-based calendar that was created and dubbed Calendar by default. To add another server-based calendar from the iCal client, choose File→New Calendar→server (the name of your description field). Then enter a name for the new calendar.